Successfully Added Single DIN 7 Inch Flip Out Display Car DVD Player "Road Knight" - GPS, DVB-T, Bluetooth to your Shopping Cart. 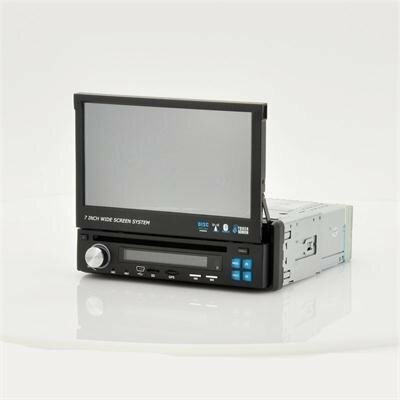 Single DIN 7 Inch Flip Out Display Car DVD Player that features GPS, DVB-T, Bluetooth connectivity and several other ways to connect hardware multimedia gadgets is a great way to combined all your media on one unit as you drive. You’ve been driving all night, your hand's wet on the wheel, there's a voice in your head that drives your heel. These are the lyrics you can be singing to as you cruise down the highway with your single DIN 7 inch flip out display car DVD player. This is the “Road Knight”, a multimedia powerhouse at a convenient 1DIN size that allows USB, micro SD card, CD and DVDs to be inserted as well as iPods to be connected. Having DVB-T means it transmits compressed digital audio, digital video and other data in an MPEG transport stream, using coded orthogonal frequency-division multiplexing (COFDM or OFDM) modulation therefore you can watch TV via the 800x480 resolution 7 inch flip out display screen. Your passengers can stay entertained during long car trips and as a driver, you’ll have a reliable and easy to use GPS system at your fingertips. The “Road Knight” even has Bluetooth connectivity that allow you to have both hands on the steering wheel while being accessible to family, friends, as well as your work. Being a 1 DIN car entertainment system with a 7 inch flip out screen, the "Road Knight" gives you the screen size of a 2 DIN car DVD player while still saving space on your car's center console. After installation, it comes alive when the combination of sound, video, GPS, and more that is easily accessed over the 7 inch display. Simply insert a USB drive, SD card or DVD into this 1 DIN Car DVD Player and you will be able to play all your favorite movies or music directly or if you prefer, you can listen to your favorite FM/AM radio program. In stock now, we guarantee next day shipping and offer a 12 months warranty on all our products. Brought to you by the leader in electronic devices and wholesale car DVD players, Chinavasion.